There will be an announcement in JK of East this Chandrat (Monday), apparently already read in West. Western Canada Mulaqat for Jamati work is expected for Vancouver, Edmonton and the Prairies. So far, no Darbar news. Pluralism Center meetings and Aga Khan Garden opening may be part of the event during the visit. Our beloved Mawlana Hazar Imam has authorised the Ismaili Leaders’ International Forum (LIF) to inform the Jamat formally that, responding to an official invitation from the Government, he will visit Canada in early May 2018. At this time, alongside engaging with activities relating to the initiatives of the Aga Khan Development Network (AKDN) and the Global Centre for Pluralism (GCP), Mawlana Hazar Imam has graciously consented to undertake Jamati work for the Jamats of British Columbia, Edmonton and the Prairies. This follows the completion of Jamati work that Mawlana Hazar Imam undertook in Eastern Canada in November 2017. Mawlana Hazar Imam has confirmed his intention to continue granting Diamond Jubilee visits to other Jamats during 2018. Mawlana Hazar Imam will conduct Jamati work in Vancouver on May 5, 6 and 7. BC Place will be the primary venue. 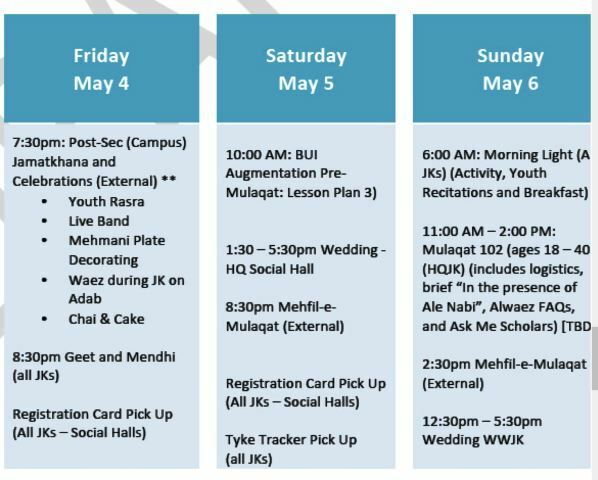 Jamati work for the Edmonton and Prairies Jamats together will be conducted in Calgary on May 9, 10 and 11. The BMO Centre, Stampede Park, will be the primary venue. Specific dates for the various ceremonies will be announced next week, once the registration process is complete and the allocations assigned. For full pre pradhramni Program see the pdf. The image is just a small part . “His Highness the Aga Khan is visiting Canada this month as part of an international celebration of his 60th, or “Diamond Jubilee,” anniversary as spiritual leader of the world’s Ismaili Muslims. I’ll be delighted to join past and present Canadian leaders of all political stripes in celebrations of his remarkable six decades of leadership. Frankly, the visit also affords us all an opportunity to turn the page from domestic political squabbles to what’s really important: the Aga Khan’s vital and ongoing global contribution to the most important project of our time, promoting pluralism and understanding in a fractured and angry world. Like every Canadian prime minister over the past 60 years, I had the opportunity to work closely with the Aga Khan. One moment in particular has stayed vividly in my mind. It was just weeks after 9/11. The world was still reeling from the unspeakable terror attacks. I hosted the Aga Khan in January 2002 in Ottawa. Our agenda was his vision of using the concept of pluralism as a practical means of fostering peace and helping to bring about greater stability in fragile societies and failed or failing states. What struck me then has stayed with me since. In that moment of tremendous global danger, while other international leaders were preaching messages of militancy and hate, while my own colleagues among Western leaders were looking – vainly, it would turn out – to military solutions, the Aga Khan spoke movingly but clearly and determinedly about the practical, on-the-ground improvements that could be made in the day-to-day lives of people in some of the world’s most troubled lands. Instead of bluster and confrontation, he spoke of understanding and mutual support. Instead of emphasizing the differences that drive nations and societies apart from one another, he talked about our common humanity. In fact, it was in that meeting that we discussed his idea of making Canada the home for an international centre to promote a world where human differences are valued and diverse societies thrive. In an angry, frightened, traumatized world, while other leaders prepared for war, the Aga Khan was laying the plans for a Global Centre for Pluralism. Instead of emphasizing the differences that drive nations and societies apart from one another, he talked about our common humanity. What was true 17 years ago in the dark days following 9/11 is as true today in a world that in many ways seems often angrier and more frightened – especially here in the West. Now entering his seventh decade as leader of his faith, he keeps persevering, undiminished and undeterred. And we need his passion and his message more than ever. Perhaps it’s not too surprising that I should be drawn to the Aga Khan and his example. In many ways, his credo of bridge-building, respect for human dignity, his devotion to moderation and decency, his celebration of diversity and pluralism, are what our own country, Canada, is all about. That’s why our country’s Parliament, during the government of my successor, Stephen Harper, granted His Highness the very rare tribute of Honorary Canadian Citizenship. It’s why the Aga Khan’s Global Centre for Pluralism chose Ottawa – of all the capitals of the world – for its headquarters. He chose Canada so he could showcase a world where human differences are valued and diverse societies thrive. And it’s why the Canadian government, year after year, has worked so effectively with the Aga Khan Foundation Canada in delivering development programmes ranging from rural development in Bangladesh, India, Pakistan and Tajikistan to early childhood education in East Africa. Because we recognize in this man and in his faith a good deal of what inspires the best in ourselves. That dialogue and understanding are a means to peace and stability. That what makes each of us different does not need to be a source of conflict or envy or suspicion, but instead something to treasure and celebrate. Like me, you may just think of these characteristics as the “Canadian Way.” But they’re also in short supply in today’s world. That makes our mission as a country more important. And it makes the work of the Aga Khan indispensable. Rt.-Hon. Jean Chrétien served as Canada’s prime minister from 1993-2003. News and press clips should be posted in the following thread.